Boulder County, Colo. - Elder abuse is not something many people think about, but every year an estimated 5 million older adults experience some sort of abuse, neglect or exploitation. It is estimated that elders in the U.S. lose $2.6 billion as a result of financial exploitation. 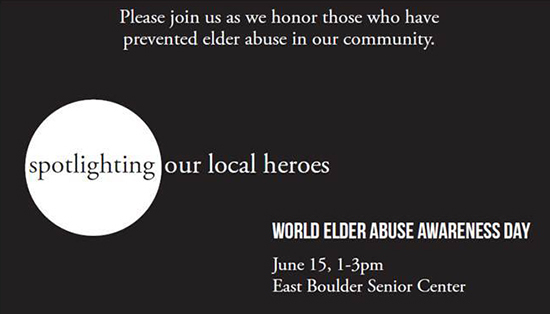 On Thursday, June 15, as part of World Elder Abuse Awareness Day, Boulder County will recognize community members who have taken action to stop or prevent the abuse of an older adult in Boulder County. What: Spotlighting our Local Heroes: Ceremony honoring those who have prevented elder abuse in our community. When: Thursday, June 15, 1-3 p.m.
Elder abuse is a problem that can happen to anyone, and does. It is often underreported with only one out of every 14 cases investigated by authorities, even less often for financial exploitation and neglect. The changing age of the population will only compound the problem in the coming years, as the number of people 65 and older will double by the year 2050, and those 85 and older will almost triple. This event is free and open to the public. Boulder County District Attorney, Stan Garnett, will offer opening remarks. Mary Young, Boulder City Council, will host the event, as special recognition awards are be presented to Boulder County community members who have taken an interest in and an action to prevent elder abuse. If you have questions or would like additional information about the event, contact Erica Corson, Elder Rights Program Manager with the Boulder County Area Agency on Aging, 303-441-1170.